CSK vs SRH Today IPL Match Prediction – ICE Dhongi Baaba predicts that Sunrisers Hyderabad might win this match today. 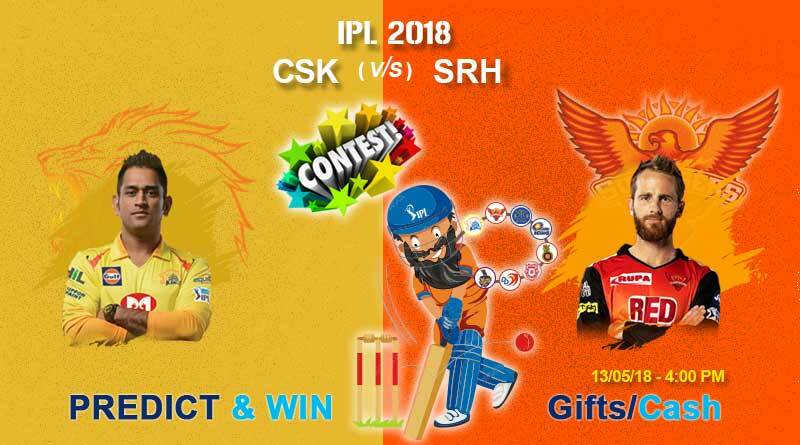 Today is the 46th match of the IPL 2018 and between Chennai Super Kings vs Sunrisers Hyderabad (CSK vs SRH Today IPL Match). Super Sunday sees first placed Sunrisers Hyderabad take on the second placed Chennai Superkings in Pune. While SRH are already through to the play-offs, CSK still require one win to make it. With the finest teams taking on each other, expect one of the best matches in the Indian Premier League this year. Sunrisers Hyderabad are having the best season they could have imagined. With their team clicking perfectly they have delivered the stuff of dreams this season. Not only are they the best bowling side this season, boasting of the likes of Bhuvneshwar Kumar and Rashid Khan who along with others have defended totals as low as 120 and 130 successfully but last mach they also showed their batting might. They cantered to 187 for just the loss of one wicket against the Delhi Daredevils with Kane Williamson and Shikhar Dhawan putting on a master class. For SRH Williamson has been the biggest boon till now. Excelling in captaincy, his batting has been even better, scoring runs for fun. Well what more do we talk about the SRH? The superlatives can just go on and on for them this year. CSK who have done good for themselves as well have had a few hiccups recently. Losing to RR recently would have hampered their spirits a bit. We however expect them to go with the same team as they hardly chop and change. Chennai Super Kings: MS Dhoni (C), Suresh Raina, Ravindra Jadeja, Faf du Plessis, Harbhajan Singh, Dwayne Bravo, Shane Watson, Ambati Rayudu, KM Asif, Kanishk Seth, Lungi Ngidi, Dhruv Shorey, Murali Vijay, Sam Billings, Mark Wood, Kshitiz Sharma, Monu Kumar, Chaitanya Bishnoi, Imran Tahir, Karn Sharma, Shardul Thakur, N Jagadeesan, David Willey. Sunrisers Hyderabad: David Warner, Bhuvneshwar Kumar, Manish Pandey, Rashid Khan Arman, Shikhar Dhawan, WriddhimanSaha, Siddarth Kaul, Deepak Hooda, Syed Khaleel Ahmed, Sandeep Sharma, Kane Williamson, Carlos Brathwaite, Shakib Al Hasan, Yusuf Pathan, ShreevatsGoswami, Mohammad Nabi, Chris Jordan, Basil Thampi, T Natarajan, Sachin Baby, Bipul Sharma, Syed Mehdi Hasan, Ricky Bhui, Tanmay Agarwal. Are you going to watch live CSK vs SRH Today IPL Match?